A look at The Cow (approximately 80 days after explosion) from the W.M. Keck Observatory in Maunakea, Hawaii. The Cow is nestled in the CGCG 137-068 galaxy, 200 million light years from Earth. A Northwestern University-led international team is getting closer to understanding the mysteriously bright object that burst in the northern sky this summer. On June 17, the ATLAS survey's twin telescopes in Hawaii found a spectacularly bright anomaly 200 million light years away in the Hercules constellation. Dubbed AT2018cow or "The Cow," the object quickly flared up, then vanished almost as quickly. After combining several imaging sources, including hard X-rays and radiowaves, the multi-institutional team now speculates that the telescopes captured the exact moment a star collapsed to form a compact object, such as a black hole or neutron star. The stellar debris, approaching and swirling around the object's event horizon, caused the remarkably bright glow. This rare event will help astronomers better understand the physics at play within the first moments of the creation of a black hole or neutron star. 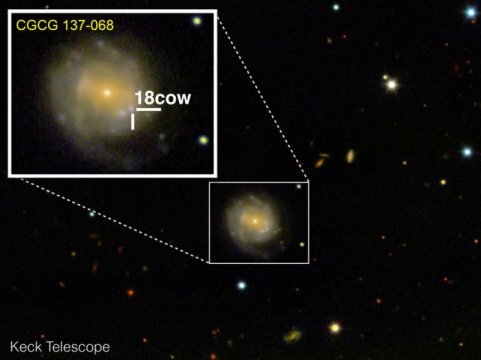 "We think that 'The Cow' is the formation of an accreting black hole or neutron star," said Northwestern's Raffaella Margutti, who led the research. "We know from theory that black holes and neutron stars form when a star dies, but we've never seen them right after they are born. Never." Margutti will present her findings at the 233rd meeting of the American Astronomical Society at 2:15 p.m. PST on Jan. 10 in Seattle. (Reporters can join the session to watch, listen and ask questions via webcast.) The research will then be published in the Astrophysical Journal. Margutti is an assistant professor of physics and astronomy in Northwestern's Weinberg College of Arts and Sciences and a member of CIERA (Center for Interdisciplinary Exploration and Research in Astrophysics), an endowed research center at Northwestern focused on advancing astrophysics studies with an emphasis on interdisciplinary connections. After it was first spotted, The Cow captured immediate international interest and left astronomers scratching their heads. "We thought it must be a supernova," Margutti said. "But what we observed challenged our current notions of stellar death." For one, the anomaly was unnaturally bright -- 10 to 100 times brighter than a typical supernova. It also flared up and disappeared much faster than other known star explosions, with particles flying at 30,000 kilometers per second (or 10 percent of the speed of light). Within just 16 days, the object had already emitted most of its power. In a universe where some phenomena last for millions and billions of years, two weeks amounts to the blink of an eye. "We knew right away that this source went from inactive to peak luminosity within just a few days," Margutti said. "That was enough to get everybody excited because it was so unusual and, by astronomical standards, it was very close by." Using Northwestern's access to observational facilities at the W.M. Keck Observatory in Hawaii and the MMT Observatory in Arizona, as well as remote access to the SoAR telescope in Chile, Margutti took a closer look at the object's makeup. Margutti and her team examined The Cow's chemical composition, finding clear evidence of hydrogen and helium, which excluded models of compact objects merging -- like those that produce gravitational waves.